All the match results are held on this page in date order, so please scroll down to find results of earlier matches. Even getting two teams together on May 6th at Newmarket had been problematic, but the two match managers thought every hurdle had been cleared. Then, just a few days before this Fixture, the God of Real Tennis decided to go the way of Jehovah with Job: testing us with misery to see if we were really serious..... Family problems, faulty backs, sprained limbs.... and we were down to two teams of three. But with the help of 11 year old Belle from Cambridge for the Ladies, and a right-handed Tim Poolman playing left-handed for Newmarket, a new schedule with everyone playing at least twice was created. So we had ourselves a match, with a final flurry of disruption in the form of a line of race-goers driving to the 2000 Guineas. In the end, we had a great day, with close matches played Best of Eight, fun tennis, and a great spirit of camaraderie all round. In the two singles matches, the Ladies were triumphant. Linda Fairbrother beat Jeremy Barnett - just - in a see-saw battle which Linda stole in the final game. Vix Harvey beat Savannah Poolman (Savannah playing for her Club, rather than for the LRTA), using bendy legs and strong ground strokes to win 8/4. In the three doubles matches, Linda Fairbrother and Fiona Brown made good use of the extra length of the Newmarket court to land a lot of serves right into the nick, which was probably luck - and definitely helpful - in defeating Jeremy Barnett and Bill Mackintosh 8/5; while Fiona Brown playing with Vix Harvey had a close shave with Bill and Tiim Poolman (playing as a leftie), in a match that went right to the wire, 7/7 40/40. Won by Vix in great style with the only Winning Gallery shot of the whole day! The most engaging match was that between Tim and Savannah (for Newmarket) against Vix and her 11 year old daughter Belle. It was only Belle's second 'proper' match, but she entered into it with gusto and a big grin on her face the whole time, making good use of her most recent lesson with the Cambridge professional, which was 'How to volley'. It was a delight to see, especially for the Newmarket hosts, who got themselves a win at last. Overall, the match was 4/1 to the Ladies - and we all agreed that playing twice was great, and playing such close matches was even better - thanks to all concerned, especially Andrew the Newmarket professional for his marking, and Hazel Dunn who was, alas, one of the walking wounded so couldn't play, but still provided a delicious lunch. Should anyone wonder what happened to the “LRTA v T & RA” fixture, this was it. The fixture has been re-christened to take into account that those playing against the Ladies were always Queen’s players anyhow. But the particular edge of a match between the two UK Real Tennis organisations was still there, never fear. Izzy and Georgie got off to a slow start and quickly went 1 – 4 down (both independently confessed that they were not morning players). Eventually they woke up and roared away to take the set 6 – 4 and playing very consistently took the second set 6 – 1. First match to the LRTA. The Evie and Linda pair was on song in the first set, playing beautifully and hitting some lovely volleys to take the set 6 – 1. Their good play continued with some excellent defending of the dedans plus retrieving off the tambour to go 5 – 2 and match points up. However, at this point they suddenly became a little tentative and let the chaps back in the game, to lose the second set 5 – 6. Starting at 3 – 3, the match went game for game with Bernard and Harry becoming more confident and attacking as the game progressed, so they took the final set 6 – 5. The match stands at 1 – 1. Michael Lingens v Izzy Candy, playing off level. In the first set after 2 – 2, Izzy didn’t get a look in. Michael played beautifully, hitting deftly with great width and length and Izzy not knowing whether to half-volley the ball or let it come off the back wall. So the first set went to Michael 6 – 2. A couple of good shots at the beginning of the second set and Izzy’s confidence was restored. The tables turned and it was Izzy hitting to a good length and lovely width, in addition to some super retrieving. She took the second set 6 – 1 and, starting the third set at 3 – 3, romped away to take the final set 6 – 3. This gave a 2 - 1 victory to the LRTA. Many thanks to Simon Mansfield and Queen’s for hosting the fixture. First match: Georgie Willis (LRTA) beat John Lennon (Bristol) 4/6, 6/5, 6/5 played level as both were off the same handicap. The first set was played with full deuces and the next two sets with forty-all because of time constraints. There were great games and excellent tennis. ​Second match: Sarah Bryan (Bristol and LRTA) & Angela Probyn (Bristol and LRTA) beat Lucy Davies (LRTA) & Denis Mullan (Chairman of Bristol) 6/3, 1/6, 6/4 played level but with forty-all throughout. Again good tennis and some very creative organisation on Angela's part! Many thanks to Bristol for hosting the match and to both match managers for organising such evenly matched games. Greeted by the smell of new paint, and the lovely luminosity of new lights, 18 old and young (mostly old) assembled at Hardwick for this popular event. We were paired to keep handicaps as close as possible, though Jill Newby upset the draw by being a late replacement, as she is much too good for most of us. Due to some late arrivals (held up by traffic) a bit of last-minute juggling was required, in which Tim Tomalin was thrown around a number of partners until he came to rest with Jill - lucky chap. Four pairs played in each round robin group, with the winners of each group fighting it out in the final. Despite the organiser Sheila Macintosh’s best efforts with the pairings, only two of the twelve matches went to 5/6, but, whatever the score line, they were all closely-fought and spectators in the dedans had their money’s worth (which included the usual excellent Hardwick lunch, which this time featured nasturtiums in the salad, delicious and artistic). 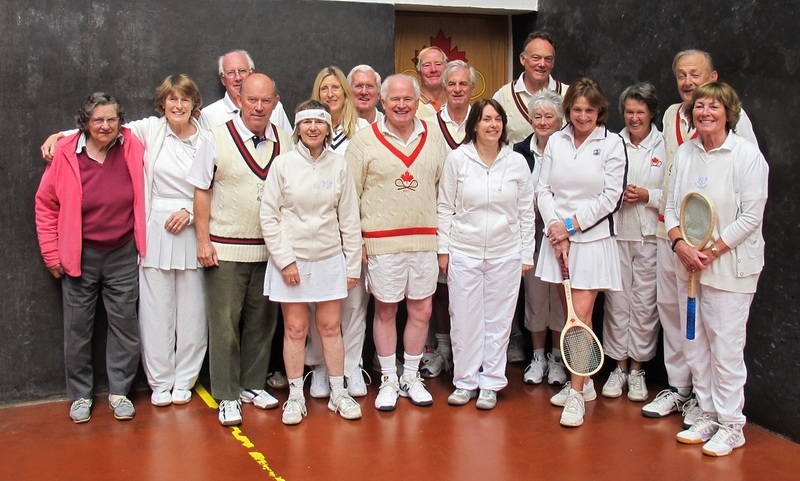 In both groups, the winning pairs had swept through with three wins, so there was little to separate them as the Final began: Lucy Davies and Peter Swiss against Sarah Brownlee and Peter Crerar, with Lucy and Peter receiving Half 15. All was even to 2 all, with Lucy continuing to play way above her handicap as she had all day. Then the stronger ground strokes of their opponents started to tell; both Sarah and Peter C solid into the corners, and making good use of overhead shots down the middle of the court. They crept ahead, 3/2, 4/2, 5/2 with a bit of a rally from Lucy and Peter S to make it 3/5. In the next game, Lucy and Peter S were 30/0 up, with 2 good chases to defend, but could only convert one to make it 40/15. Sarah and Peter C held their nerve, got it to 40 all, and with Peter C’s serve, took the match 6/3. A lovely time had by all with huge thanks to Sheila Mac for the organisation, to the Hardwick ladies for the copious hospitality, and to the Club for hosting us.